Do you have a new baby on the way and need to pick a theme for his or her room? Has your daughter decided pink is out and green is in? Regardless of the reasons, if it’s come time to paint and decorate your child’s room in Ellicott City, you may not know how you should go about tackling the change. However, redesigning your child’s room can be a fun activity where you can really get creative, especially if you can get your child involved as well! Check out these fun painting ideas for your child’s room! Redesigning your child’s room can be a fun activity where you can really get creative, especially if you can get your child involved as well! Choosing a color scheme can be one of the most frustrating parts of any room design, but it’s also the one of the most basic. Break free of the idea that pink is for girls and blue is for boys and pick a color scheme that is not only dynamic, but will remain age-appropriate and relevant throughout your child’s life. 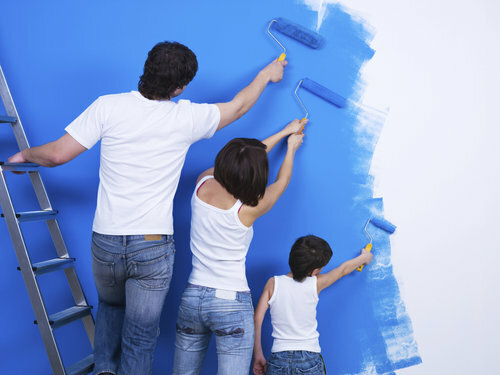 Sure, touch-ups and minor remodels will probably need to be done as your child ages, but if you can pick a good base color, you can lessen your load down the road when it comes to redesign. Try out Benjamin Moore Paint’s Personal Color Viewer and explore paint combinations using your own photos to try out various color schemes before you buy, or consider hiring a personal color consultant through Columbia Paint Company. If you ask your child how he’d like to decorate his room, he will probably reply with something similar to, “I want blue and cars and Spiderman and stars and green.” It is possible to accommodate at least most of your child’s requests while keeping the room aesthetically pleasing and functional. Try a shade of blue for three walls and throw up a green accent wall or ceiling. Paint a car scene along one wall, give him some glow-in-the-dark stars on the ceiling, and get him Spiderman bed sheets! The blue and green walls should remain appropriate throughout his life and the cars can be painted over later easily. Planning on re-decorating your child’s room in Ellicott City? Columbia Paint Company is your one-stop shop for all of your home-decorating needs in Ellicott City. From fabulous Hunter Douglass window treatments to beautiful Benjamin Moore paint products, we have everything you need to make your dream home design a reality. Schedule an appointment with our design consultant today!